Cape Cod Beer is bringing the inaugural Shuck! A Day of Oysters & Beer to the mid-Cape. This day-long event celebrates all things oysters and will be held at Cape Cod Beer’s brewery in Hyannis. With the help of the Greater Hyannis Area Chamber of Commerce and the Barnstable Clean Water Coalition this celebration of the region’s bi-valves will be held on Saturday, October 20th from 1:00 pm to 5:00 pm. Big Rock Oyster & Cape Cod Oyster are operating raw bars featuring oysters from towns all over Cape Cod. The Barnstable Association for Recreational Shellfishing will be selling clam chowder and The Pineapple Caper food truck will sell non-seafood food offering. The popular local band 57 Heavy headlines the music for the day. 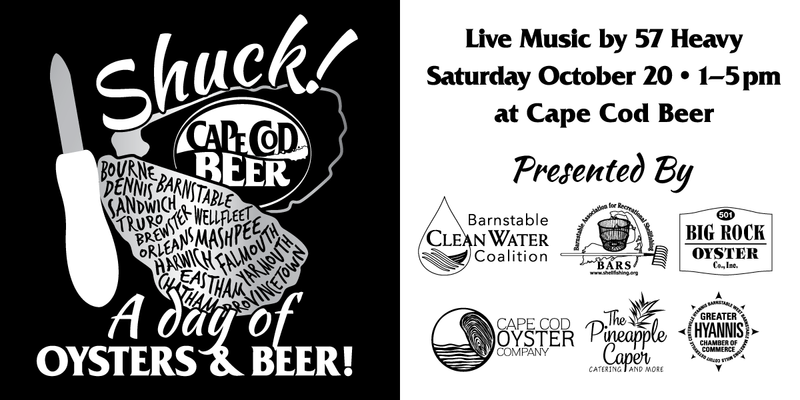 Cape Cod Beer’s Shucker’s Reward Oyster Stout – based on an Irish extra stout and made with oysters from across Cape Cod – will also be available at the event. The autumn event is meant to highlight the wide variety of oysters that Cape Cod offers as well as their economic and ecological impact on the region. Education is another facet of this event. Cape Cod Community Media Center & Barnstable Channel 18 are assisting in the creation of a series of documentary shorts, “Movers & Shuckers,” that include interviews with local shellfishers, the Commerical Fisherman’s Alliance and the ARC oyster hatchery. Event goers will be able to browse educational exhibits by the Barnstable Clean Water Coalition. While Cape Cod Beer has on-site parking, carpooling is encouraged to help reduce congestion. Shuck! A Day of Oysters & Beer tickets can be purchased at https://CapeCodBeer.com/Shuck. Those who are interested can follow Cape Cod Beer on Facebook, Instagram or Twitter.